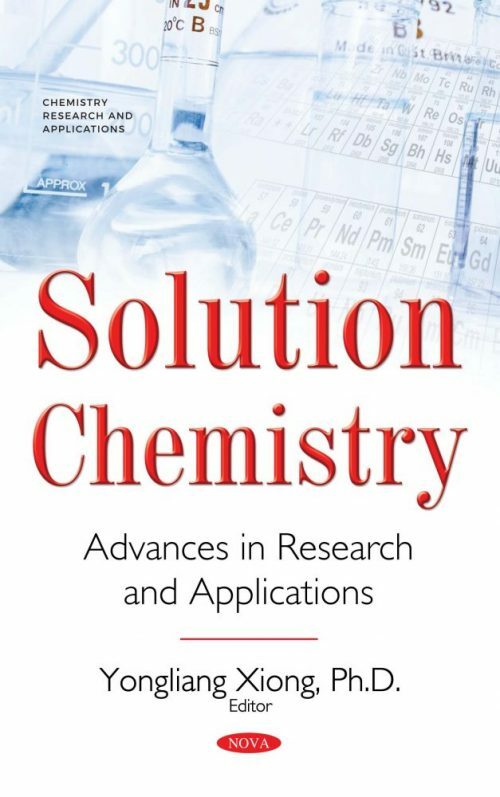 The aim of this book is to present original data and comprehensive reviews of state-of-the-art work that advance our understanding of solution chemistry in diverse fields, authored by the diverse experts. 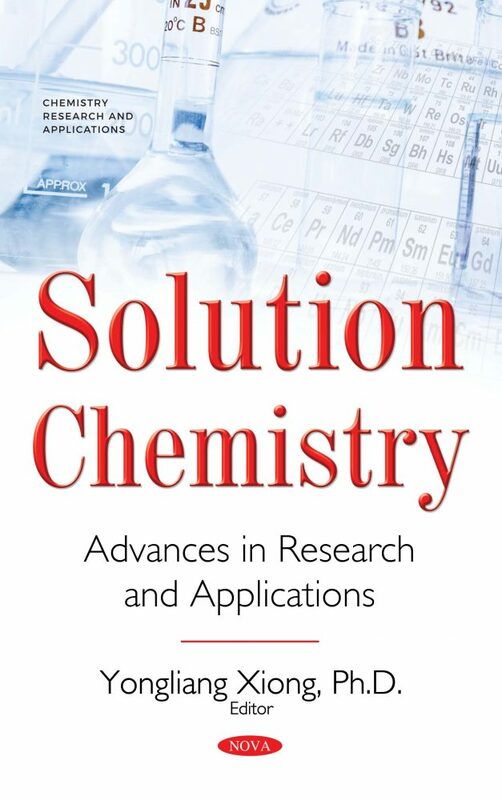 The first two chapters address advances in solubility measurements. The first chapter provides the experimental data and thermodynamic modeling regarding solubilities of uraninite [UO2(cr)], pyrochlore [(NaCa)Nb2O6F(cr)] and microlite [(NaCa)Ta2O6F(cr)] in NaF solutions under the extreme conditions at 800oC and 2,000–2,300 bars. The knowledge embodied in the first chapter is important for understanding the formation of rare metal deposits in the ultrahigh temperature hydrothermal systems. The second chapter presents an experimental study of brucite [Mg(OH)2(cr)] solubilities in NaCl solutions over a wide range of ionic strength from 0.01 mol•kg–1 to 5.6 mol•kg–1 at elevated temperatures up to 80oC. Such results are useful in many areas of study, including elucidation of the formation of recently discovered brucite-carbonate chimneys in hyperalkaline (pH 9–11), saline, hydrothermal fluids (40oC to 90oC) on ocean floors. Chapters 3 and 4 address advances in solution chemistry related to salt formations. In Chapter 3, the incoherent inelastic neutron scattering (INNS) technique was used to distinguish three water environments in bedded salts. These three environments include intergranular water molecules confined to grain boundaries, water in fluid inclusions, and structural water in hydrous minerals. Such knowledge is relevant to subsurface energy exploration and nuclear waste storage in salt formations. Chapter 4 provides the experimental evidence to demonstrate that mineral colloids derived from an engineered barrier of MgO, in high ionic strength brines associated with salt formations are nonexistent. This is attributed to the fact that the high ionic strength solutions associated with salt formations have high concentrations of both monovalent and divalent metal ions that are orders of magnitude higher than the critical coagulation concentrations for magnesium oxide derived colloids. The absence of magnesium oxide derived colloids in high ionic strength solutions implies that contributions from these colloids to the total mobile source term of radionuclides are minimal in a salt geological repository. Two chapters summarize advances related to organic materials. Chapter 5 provides an overview regarding the advances in new functionalized polysulfones. Recently developed polysulfonic films are expected to find biomedical applications. Chapter 6 includes a comprehansive review with regard to the analytical techniques for determination of trace elements in crude oils and fuel oils, and the original data generated in the laboratory. Based on these results, it seems that elements of high value could be co-extracted from crude oils in the future. The final two chapters address advances in speciation in understanding in aqueous systems. Chapter 7 presents an overview of the advances in speciation of vanadium using three techniques: Nuclear Magnetic Resonance (NMR), Electron Paramagnetic Resonance (EPR), and UV-Vis spectroscopy. Chapter 8 centers on the speciation of Am(III) in hyperalkaline solutions. The equilibrium constant for Am(OH)4– is obtained by using the Pitzer model to evaluate Am(OH)3(s) solubility data in KOH solutions.